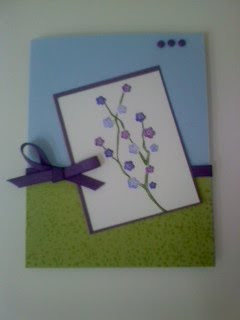 Here is another card, using the sketch from Gretchen Barron's Inspiration in Action 105. This time I have used Eastern Blooms, with eggplant and Bashful blue. It will also be a birthday card since there a quite a few birthdays in October for me. Stay tuned - I have a LateNightStampers Challenge for you!! !